Surveyors' Field Notes and Plats of Wisconsin is a collection of thousands of maps and written observations recorded between 1833 and 1866, when Wisconsin land was sub-divided into parcels for purchase and settlement. The Society owns 21 bound volumes containing hand-drawn plat maps for townships that cover approximately two-thirds of the state. Photostatic reversals of the maps are available for townships to the north. The University of Wisconsin-Madison owns the field notes. As surveyor's walked the landscape, they noted specific details about the environment in pocket notebooks. 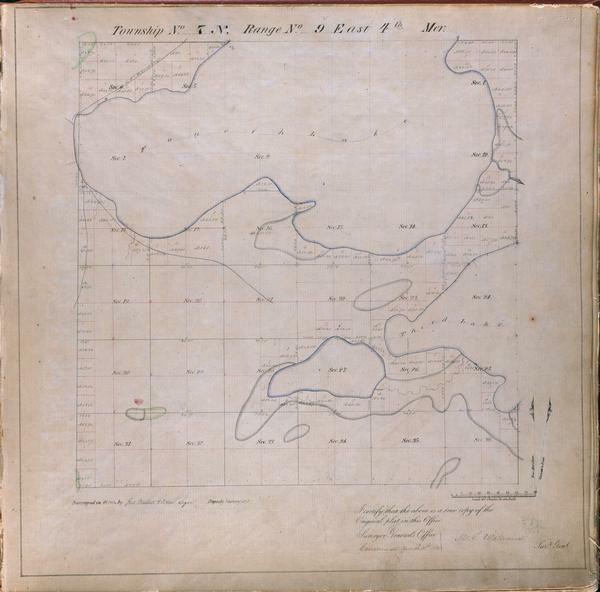 The U.S. General Land Office Surveyors' Field Notes and Plat Maps are available for viewing online at University of Wisconsin-Madison Digital Collections. The Society's Archives has microfilm of the complete sets of both the surveyors' field notes and manuscripts of the survey plat maps for every section in each township in Wisconsin. Interior and exterior survey notes are organized by township and range. Interior survey notes fill 56 reels of microfilm. Exterior survey notes fill 9 reels of microfilm. To identify the appropriate reels, researchers will need to know the township and range survey coordinates of the township they are interested in researching. With that information, reference archivists can find the applicable notes. The field notes and survey plats are also available by appointment at any of our Area Research Centers (ARCs). They may also be ordered through interlibrary loan. Between 1833 and 1866, the federal government surveyed the land that is now Wisconsin. It conducted the survey to divide the vast public domain into suitable-sized lots to sell or otherwise divest, to raise funds for the federal government, and to encourage settlement. The land was divided into 6-mile-squares called towns. Then the towns were subdivided into 36-mile-square sections. 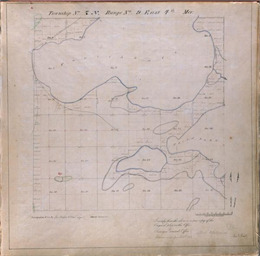 As surveyors traveled, they took field notes, which became the official record of the surveys. They recorded vegetation, especially tree cover; land features such as soils, streams and rock outcroppings; and evidence of human habitation including villages, cabins, trails and roads. Mapmakers at the U.S. General Land Office used these surveyors' notes to create official plat maps. The plat maps were used to sell or grant land to settlers, railroads, speculators and other interested parties. These plats represent some of the earliest attempts at mapping Wisconsin land at a local level. Each map allows significant detail and many maps note the locations of individual cabins, springs, millsites and landings as well as trails, rivers, streams and villages. They are a unique resource for recreating Wisconsin's pre-settlement landscape, identifying Native American cultural sites, and tracing the earliest signs of settlement. When used in conjunction with the Wisconsin Land Economic Inventory Maps, developed between 1929 and 1949, you can compare the Wisconsin landscape before it was settled and approximately 100 years later. Most maps and atlases do not circulate and must be used at the Society's Library or Archives. Also, some may be sent to any of our 13 Area Research Centers around the state for viewing. Online images from the UW-Madison Digital Collections may be copied by individuals or organizations for personal use, research or other purposes defined as "fair use" under applicable copyright laws. Anyone interested in making further use of the UW-Madison Digital Collections images or records, including commercial use, should contact the Wisconsin Board of Commissioners of Public Lands for permission. For more information, see the copyright page of the UW-Madison Digital Collections website. Other copies of the U.S. General Land Office Surveyors' Field Notes and Plats may be available through the Board of Commissioners of Public Lands for Wisconsin, a county's Register of Deeds Office, or county surveyor.